Hot green smoothie – A quick and healthy hot smoothie for a cold day! 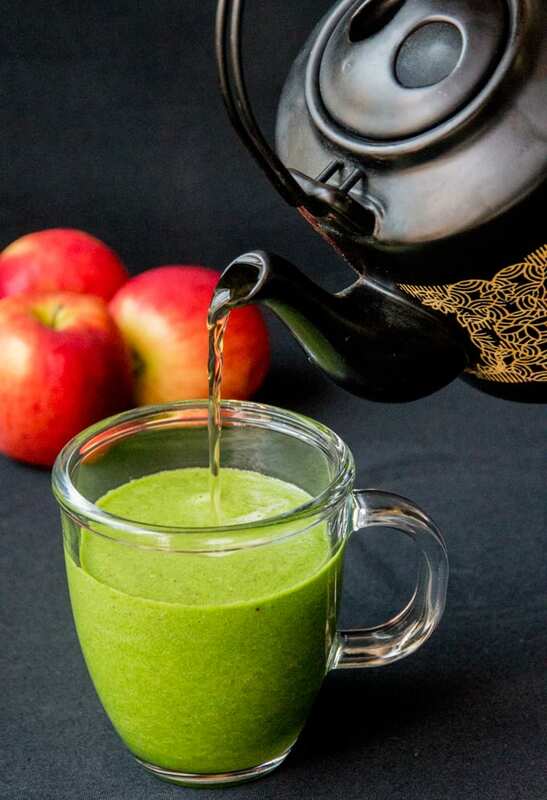 For this hot green smoothie you’re going to use the classic blend of kale, apple and dates, but today you’ll be adding green tea. I’ve not quite got my scarf and gloves out yet, but the weather is slowly getting colder. 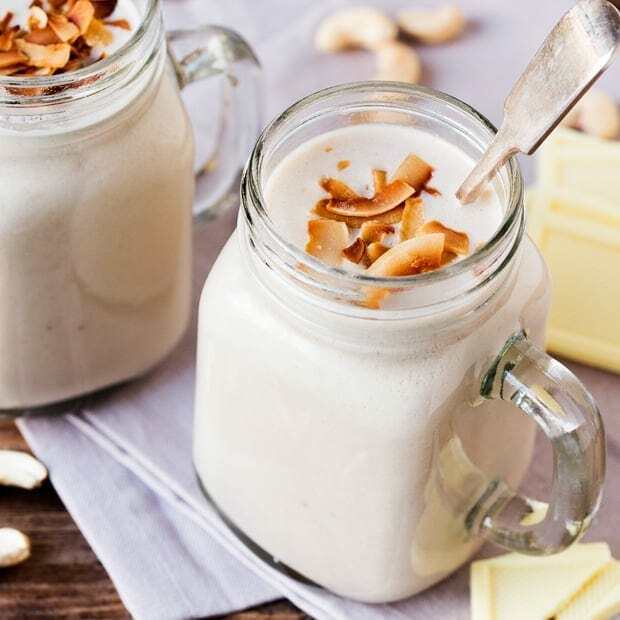 In an effort to prepare ahead, I need to start thinking about adjusting my weekday breakfasts – which usually consist of porridge or smoothies. 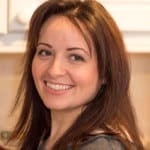 I’ll stick with the porridge, but I’m too nesh for slurping down an ice cold smoothie in the colder months – even if I have just finished a hot & sweaty workout (because I do that every day. Not.). I can feel myself slipping into the habit of hot buttered toast and coffee (i.e. the last two mornings) and I need to kick it and bring in some new hot, healthy and flavoursome breakfasts. So every Saturday this month I’m going to feature a different hot smoothie. Don’t grimace at me like that. It’s going to be delicious, I promise!! a) Juicy/refreshing/spicy with a hint of sweet – and these ones will be light smoothies that aren’t thick enough to make you feel you’re just drinking soup through a straw. 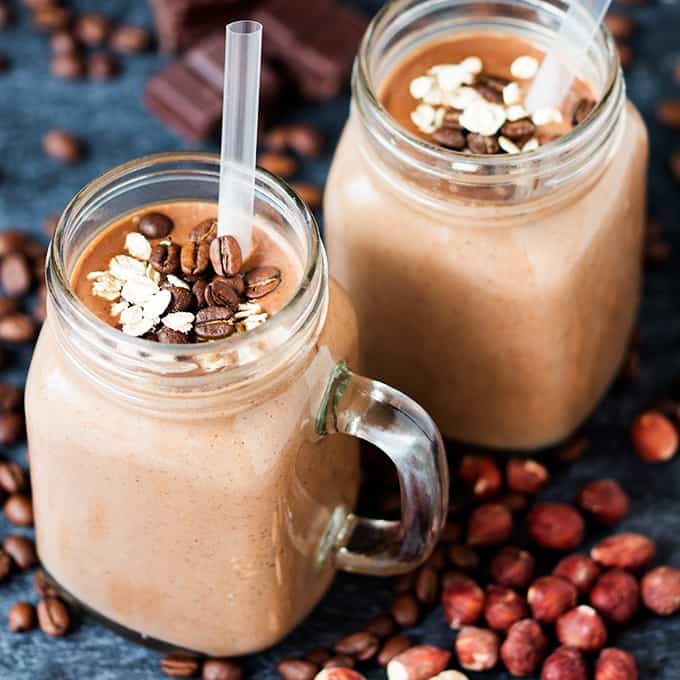 b) Creamy, warming, malty, filling smoothies that you can enjoy whilst knowing you’re still giving your body what it needs to make you feel great. So let’s kick off with good ‘ole original green. 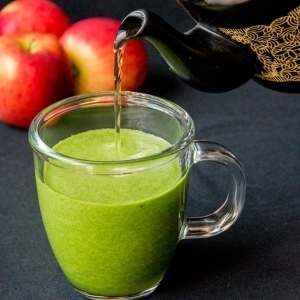 For this you’re going to use the classic blend of kale, apple and dates, but today you’ll be adding green tea. You could also swap out green tea for jasmine tea or white tea. Have you tried white tea? I’m not talking about your PG Tips builders brew, I’m talking about the upgraded version (in my opinion) of green tea. Green tea is made using relatively mature leaves of the Camellia sinensis plant. White tea comes from the same plant, but is made from the unopened buds and the young leaves. It’s got a milder taste than green tea, but is said to be higher in antioxidants. I get through 2 or 3 cups of it a day and I find it’s much gentler on an empty stomach than green tea too. Back to the Hot green smoothie! So first, a word of warning. Don’t fill your smoothie maker up with boiling hot tea. It’s either going to shatter the glass (if you have a glass jug) or it’s going to come wushing out with a tonne of pressure when you open the lid after whizzing things up. Check your smoothie maker or blender can take warm or hot liquids. Then add the kale, dates and apple to your jug. Add in a splash of cold water and a splash of the green tea. This should give you some luke warm liquid to blend your ingredients together with. Blend it all until smooth, and then pour your smoothie into a cup and pour in your green tea. Give it a mix and drink. Let me know what you think. 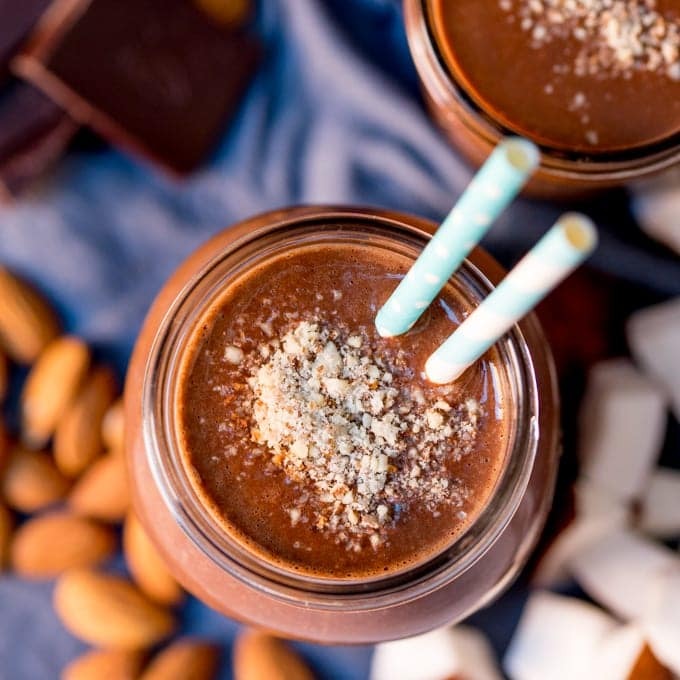 Have you any hot smoothie recipes up your sleeve? Place your kale, apple and dates in your smoothie maker. Add in a splash of cold water and splash of the green tea (see warning above about hot liquids and smoothie makers). Blend on high for a minute or two until the dates and kale have been completely incorporated. Pour our your smoothie into a cup and mix in the remaining green tea. You can knock the calorie count down by adding only one medjool date if you wish. Medjool dates are approx. 66 calories each, so just having one would reduce the calories down to 181 calories. This is new for me, what I am concern about is will the hot tea break the nutrients from the greens like kale on your recipe. Hi Andrew, I couldn’t tell you how much the nutrients would be reduced, but since you still benefit from nutrients in cooked kale – in stir fries etc, i’m pretty sure this smoothie wouldn’t kill off all the nutrients. The kale isn’t cooked, but it is warmed, so I think you’d still end up with a nutritious smoothie. Trying one of your hot smoothies every week at the moment, whilst it’s so chilly here. Last week tried the oaty one, now this kale one. I loved the sweetness the dates brought to this smoothie. Neat idea with the hot tea. I like use dates too for natural sweetening. 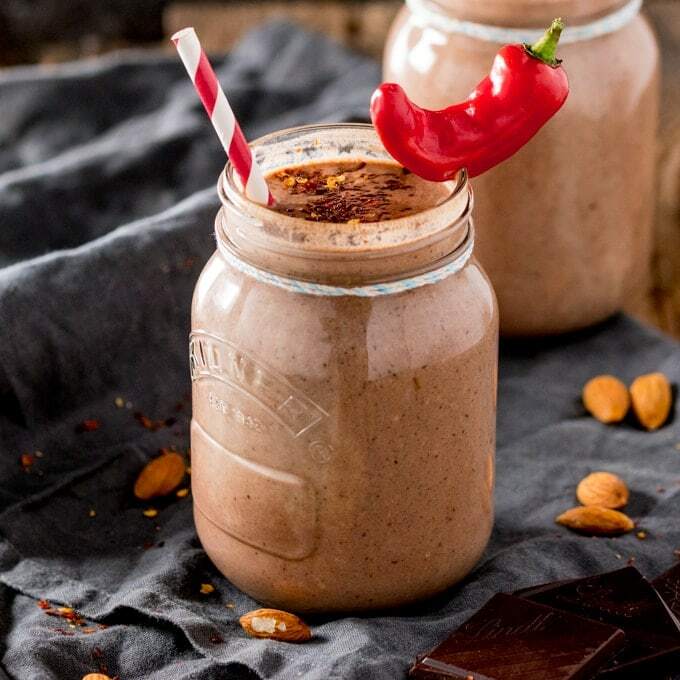 Oooh yes, dates make a lovely addition to a smoothie! Green smoothies don’t scare me, I have lots of green juice experience… and this is a great idea for winter! My magic bullet gets so neglected during the winter because I can’t imagine taking a cold to-go smoothie for breakfast with me. I bet this would be awesome, if you like the healthy green smoothie kind of thing. These are JUST the recipes I need! I use my VitaMix regularly. However, an ice cold green smoothie doesn’t set well in our cold mornings. Can’t wait to buy dates, etc. and try these! Thank you! I’ve never had a hot smoothie before 😮 It looks and sounds great! I love the idea of a hot smoothie. Like you I drink a smoothie all the time but in the cold winter months the thought of an ice cold smoothie doesn’t appeal. Great idea. Thanks 🙂 It’s a bit of a balance trying to get it to taste fresh, without being soup-like, but I think I managed it. Thanks for stopping by Elaine 🙂 I’m usually one for ice cold smoothies, but I’m a complete wimp when the weather starts turning, so I need something that makes me feel good but warms my tummy too. I’ve never heard of a hot smoothie before! However, this sounds delicious. Thanks for all of the advice , especially the bit about not shattering the glass (which also made much chuckle a little). I also love the color on this drink. Happy FF, and have a wonderful weekend!